★Using the newest formula. Cabee professional hair removal wax is gentle enough for facial hair, upper lip hair and body fine hair leaving your skin sleek. Its the ideal method for removal of unwanted hair with obvious effect. ★Place the wax into the heater of your choice. Melt to be creamy consistency. Test a small area on the backside of your wrist for temperature sensitivity before waxing. Using a spatula to spread a thin layer of wax onto the area to be treated in the direction of the hair growth(if using near the eye area, please keep eyes closed). Allow a short period to cool and then holding the skin taut remove the wax with a quick motion against the direction of hair growth. Immediately apply firm pressure to epilated area with the cushion of your fingers or palm of your hand to calm the skin. ●Temporary redness may occur after treatment for physical epilation, but will soon subside. ●Do not use on broken or irritated skin or if you have suffered any adverse reactions to waxes in the past. ●If you are on medication that affects skin or you have a skin related disorder consult you doctor before use. ●First test this product on a small patch of the skin in the area you wish to treat. If after 24 hours there is no adverse reaction proceed with full application. ●Avoid the sun, tanning and hot water for 8 hours after any hair removal treatment. After use always wait 24 hours before using antiperspirant, aftershave or astringent lotion on the treated area. ●Not edible For extemal application only. Keep out of sight and reach of children. FINE HAIR FORMULA: Benefit by upgraded ingredient, Cabee all-natual hard wax is the most efficient hair removal wax for thin fine hairs. Offer a perfect hair removal solution to facial hair, upper lip hair and body fine hair leaving your skin sleek, smooth, and visibly hair-free after use. SALON QUALITY & LARGE REFILLED PACKAGE: Comes in 1 Pound Big Volume. Infused with uplifting Aloe Essential Oil. The wax melts in seconds and create a delightful aloe fragrance to achieve a happy waxing experience and smooth skin result. Never stringy. Never crack. Never crumble. EASY TO USE: No strips required. Less painless than the strip cloth wax. Convenient than the traditional wax jar. Avoid the mess and annoyance putting in microwave frequently. Ultra flexible. This formula dry slower. Nice for newbie. HELPFUL TIP: PEEL OFF AS SOON AS THE FILM IS NOT STICKY TO TOUCH Against The Direction of Hair Growth. SAFE & LASTING: Waxing is painless physical hair removal, it’s much safer than using hair removal cream, less skin irritation problems, more smooth and delicate your skin. Waxing is much more lasting compared with other shaving products, it will keep your skin smoothly at least 3 weeks, starting today no bothered by the unwanted hair. 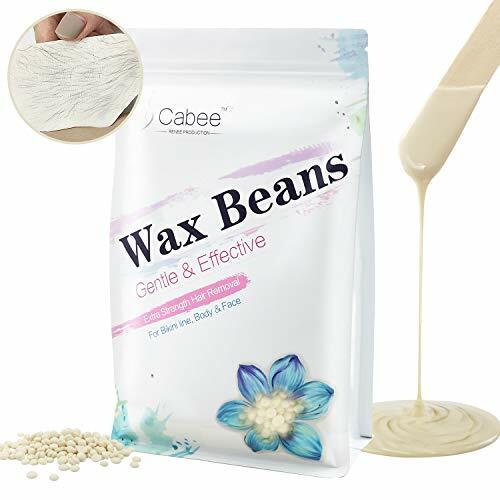 MONEY BACK GUARANTEE: You will receive a full refund within 90 days from purchase, if you don’t like Cabee wax. NO questions asked. No headaches or hassles. 100% Satisfaction Guarantee. We are not only authorized seller but manufacturer. Our customer support 24 hours service to help. This entry was posted in Waxing and tagged 16oz, Beans, Body, Facial, Fine, Hair, Hard, INGREDIENT, Painless, Upgraded, Upper, Waxing, Women. Above and Beyond, Gotta love this One.